The NRL has announced a new television deal with Channel 9 to run beyond 2018. Some of the details around that agreement will be terrific for the game. The fact the NRL will take back the right to schedule fixtures in an even manner, rather than allowing Channel 9 to dictate which teams feature on their games will have a huge impact for the clubs with lower profile and will finally provide a level playing field. But this deal appears to have been done with little to no consultation with any of the key parties. Leading players have been calling on the NRL to structure a season that sees players playing less games – that won’t be the case under the new agreement. Origin scheduling has been a major talking point. A slight change has been made with the second match to be played on a Sunday night. There has been no mention of expansion, which is a concern. The A-League in particular is making huge strides in the Australasian sports market and the NRL continues to sit on its hands while other codes take the game to new places. 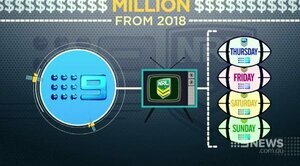 When the last television deal was signed in 2013, the NRL was determined to ensure all existing clubs were given the chance to become financially stable. This new deal will be worth double what the previous deal is worth – surely now those clubs are sustainable. The NRL needs to have a presence in Perth and a second Brisbane team by 2018. The mid-year ANZAC test has been scrapped as part of this new deal but the New Zealand Rugby League knows nothing about that. I actually think rep footy is best played at the end of the season anyway but you’d think the NZRL deserves to be involved in those discussions. The revenue gained from that fixture has traditionally funded the sport’s high performance administration in New Zealand and its axing could have a big impact on the governing body in this country. It is the height of arrogance if Dave Smith and co have negotiated this deal and not kept the NZRL informed of it. With pay television, New Zealand and digital rights still being negotiated there is much more to play out here but while there are some improvements with this announcement today, there remains so rather large concerns as well. With the deal having such a huge effect on the sport, you’d think there would be more open discussion amongst the major stakeholders. This article has been written by Dale Budge. Dale is a well known rugby league commentator and journalist, having covered the sport for over 10 years.